This low price compilation includes the home artists of course, Foretaste, Celluloide and Dekad, but also names such as Komputer, SMPJ, Joy Electric, The Rorschach Garden, Neues Kombinat, or Psyche covering their favorite tracks from the BOREDOMproduct catalogue. A unique and cutting edge compilation concept! 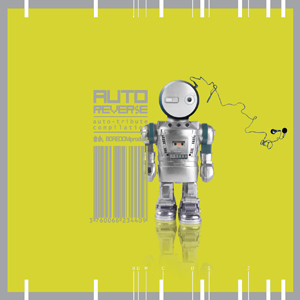 AUTO-REVERSE is the brand new BOREDOMproduct compilation, after Synthétique in 2002. This low price compilation includes the home artists of course, Foretaste, Celluloide and Dekad, but also names such as Komputer, SMPJ, Joy Electric, The Rorschach Garden, Neues Kombinat, or Psyche covering their favorite tracks from the BOREDOMproduct catalogue. The result is a 17 track album full of twists and fresh electronic curiosities like Komputer or SMPJ covering Celluloide, Psyche covering Foretaste... A unique and cutting edge compilation concept!